All Pro Tracks require connectors to attach every section and corner to each other. • One Connector is required to attach every piece to another. • Pro Tracks come with Carriers that roll your muslin's along the track. 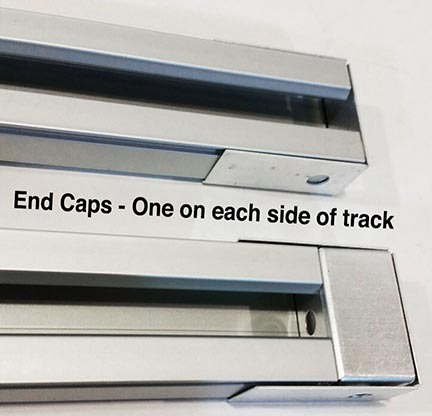 • End Caps can be added to any track to stop your muslin’s from falling off one end. • The other side has an end cap with a removable cap to remove or add more carriers if needed. • Add extra Carriers & Muslin Clips to muslin's for more support. • We recommend between 5 to 10 Carriers & Muslin Clips per muslin. • Attach your muslin's to the track carriers with Muslin Clips, sold in packs of 10 & 30. Muslin Background Tracks to change backgrounds effortlessly with our Muslin Background Track System., design the track based on the dimensions of your space!, Light weight aluminum track can be mounted on ceilings or walls to move your muslin backgrounds or other materials.